Wrapped in the warmth of Merino and cashmere, this lovely Night Skies shawl feels like a nurturing hug. 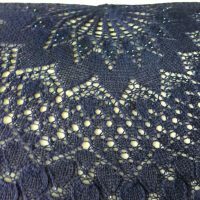 Soft and cozy, this lovely navy blue yarn is just the ticket to show off the stitch definition of this pattern. Wear it with your favorite pair of jeans or a dazzling evening dress, either way you’ll look fabulous wearing it. This was another fun pattern to knit. I didn’t even mind the repetitive border edge because it knits fairly fast. 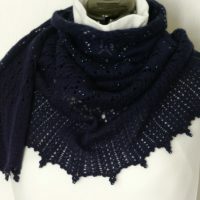 Plus it looks beautiful in any kind of yarn, and especially shows the stitch definition using Knit Picks MCN Capretta yarn. 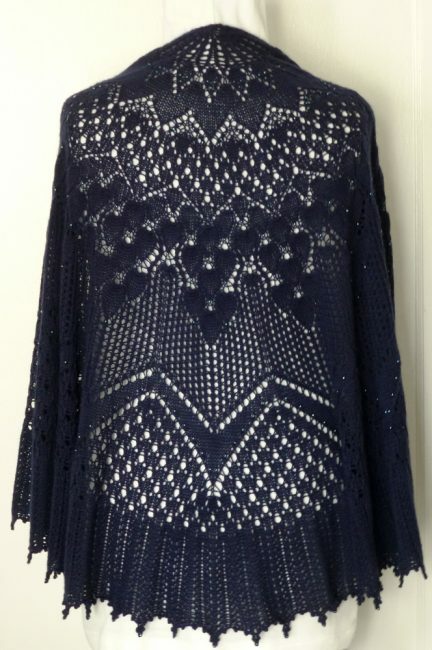 Love how elegant this turned out in the navy blue and the beads are a perfect match. The fleur de lis crochet picot bind off was a bit of an inspiration since I was running low on the beads and there weren’t any more to be found at any of my bead stores. Size: Measures 66” wide by 32” deep. View of top of shawl. 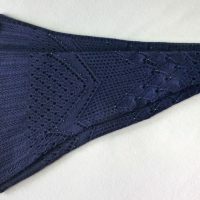 View of edging of shawl. 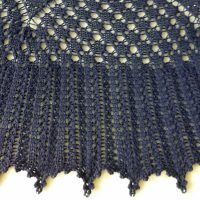 *Special thanks to Nim Teasdale (Don’t Panic shawl) for creating such a lovely pattern.